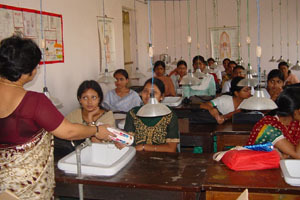 A team of young doctors and health workers managed by the Programme-In-Charge works in the HCPSC project. They visit different schools and go through a thorough health check-up including 25 types of tests for each student once or twice per year to give them an ongoing record of their health. 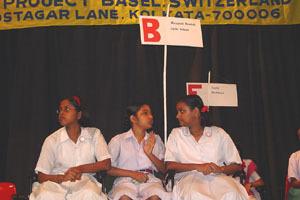 They also teach the students health awareness. The doctors record all information about their health condition on their health card and refer the patient to other doctors, if necessary, for treatment. 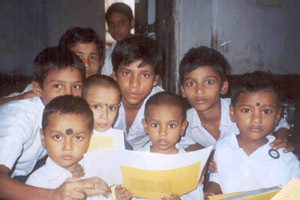 The students are advised to come to the outpatient clinic of S. B. Devi Charity Home for free treatment. 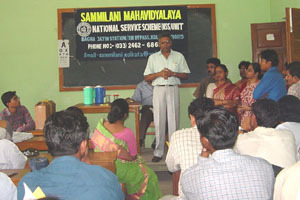 Their guardians and family members are also given free treatment in the clinic. Statistical reports, both classwise & schoolwise are forwarded to each school. 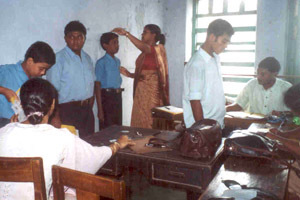 In 2007 we completed a 2nd round check-up in 11 schools where about 1,500 students were checked and a 1st round check-up in 22 schools in which about 7,200 students were checked. The school authorities and teachers were impressed of the professionalism of the doctors and gave letters of praise and thanks to the society for providing this valuable service to the students. 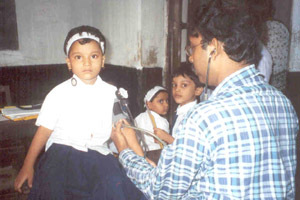 S. B. Devi Charity Home is often requested to provide a team of doctors for First Aid from Circle Sports Committee, Circle IV and Circle Level Sports Committee. These sports fall under different circles. 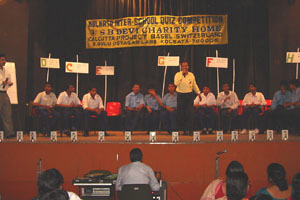 Each circle consists of about 50 schools. Whenever there are sports and physical education activities in primary schools we are requested to send a team of doctors for first aid. We are also often requested by Calcutta University to send a team of doctors for the swimming competitions in schools and national levels too.